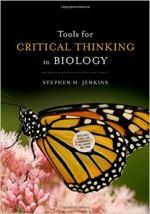 As you may have seen, NCSE posted a chapter from Stephen H. Jenkins’s fabulous new book Tools for Critical Thinking in Biology (PDF) (Oxford University Press, 2015) on our website. The excerpt has been wildly popular with visitors to our website—the chapter was downloaded over 9,000 times in the few weeks it was posted. Jenkins is a self-identified “accidental biologist,” who credits his college professors with developing his love of science. He taught both junior and high school before getting his Ph.D. from Harvard University, and never lost his desire to teach. He was a professor for over thirty years at the University of Nevada, Reno, where he conducted research on the behavior and ecology of beavers, ground squirrels, wild horses, and more, and also continued to sharpen his teaching skills. Jenkins was kind enough to sit down with me this week to chat about his book and his motivation for educating all students. I’ve been interested in teaching how science works throughout my career. This happens naturally in working with students to design and conduct projects in the lab and the field, but not necessarily in traditional classroom instruction. I wanted to bring the scientific process into the classroom, which I initially did in courses in ecology and mammalogy for biology majors to extend their understanding of the scientific process beyond what they would learn in labs and field trips. I then developed a core course in research design for graduate students that introduced them to key ideas in the history and philosophy of science and to general principles of designing experimental and observational research. As I continued teaching these courses, I became more and more convinced of the importance for nonscientists to understand how science works. Therefore I developed an introductory biology course for nonmajors called “How science works: Biological case studies.” My current book, Tools for Critical Thinking in Biology, grew out of that course in the sense that I wish I had had a book like this available when I was teaching the course. We excerpted chapter 8, “From Causes to Consequences: Considering the Weight of Evidence,” on the NCSE website. Can you tell me more about this chapter and how it fits into the book as a whole? In chapter 1, I explain that scientists have two main sources of motivation: discovering new facts about nature and learning how things work and how they evolved, i.e., learning about causation. The “consequences” in the title of chapter 8 refer to the practical decisions that have to be made based in part on scientific knowledge. In the case of chapter 8, where I focus on ecological examples, these decisions have to do with management and conservation of wild species and ecosystems. Earlier chapters in the book introduce the basic tools of science: observations, data, experiments, comparisons and correlations, and models. Chapters 7 and 8 are both about the complexity of causation, with chapter 7 using examples from genetics and chapter 8 using examples from ecology. The main point of both chapters is reflected in the subtitle of chapter 8: “considering the weight of evidence.” This alludes to the fact that we rarely have a “smoking gun” that provides a final, definitive answer to a scientific question. Instead, we have a collection of descriptive, correlational, and experimental evidence. The lines of evidence in this collection may point in different directions, yet we may need to make a policy decision based on the evidence. How do we do this? People often seek simple explanations for phenomena when simple explanations aren’t realistic. For example, some contrarians accept natural variation in climate but deny human impacts on climate. In fact, both natural and human factors influence climate. This is an important manifestation of the complexity of causation that I introduce in chapter 8 and develop further in chapter 10 on climate change. The focus of this book is not climate change, but you included a chapter on this topic. Why was it important to include climate change in this book, and how does it fit into the ideas about critical thinking in biology? I wrote about climate change in the last chapter for two reasons. First, climate change is the most challenging and most important problem of our era, with major impacts on both human society and natural environments. Second, I use the example of climate change in this chapter to review six basic tools for critical thinking, in hopes that these tools will be fresh in the minds of readers when they finish the book. In 1990, an anthropologist named James Lett published an essay in Skeptical Inquirer called “A Field Guide to Critical Thinking.” He used the acronym FiLCHeRS to represent six key principles of critical thinking: falsifiability, logic, comprehensiveness, honesty, replicability, and sufficiency. Lett applied these principles to debunking various paranormal beliefs; I decided to see how FiLCHeRS might apply to arguments about global climate change. I show that the hypothesis of recent anthropogenic climate change is falsifiable, as all good science must be; is logical; is comprehensive in considering the full weight of evidence available about Earth’s climate; is honest, in contrast to the tactics of climate change contrarians; is replicable and has been extensively replicated; and is sufficient, unlike the arguments of contrarians who promote skepticism based on isolated events. I conclude chapter 10 by discussing inertia, feedback, and tipping points as three general principles of climate change and by describing climate change as a problem at the intersection of science, politics, economics, and ethics. As the philosopher Stephen Gardiner wrote in A Perfect Moral Storm: The Ethical Tragedy of Climate Change (2011), “the deepest challenge [of climate change] is ethical.” As I show in the book, science is a good vehicle for learning critical thinking skills, but these skills must be applied to the political, economic, and ethical dimensions of decisions as well. The book includes two appendices related to climate change, one to help readers understand the implications of complex models of climate change, another to help them evaluate the evidence that scientists share an overwhelming consensus about how humans influence climate. How do you envision teachers using this book? Pre-college teachers can use my book as a source of topics for discussion or debate or to learn about use of case studies in teaching. Teachers of introductory biology classes can use it as a textbook, especially if they emphasize scientific methods and critical thinking. Some colleges and universities have unique classes in which Tools for Critical Thinking in Biology can be especially useful. These include classes in critical thinking per se in departments such as philosophy, anthropology, and psychology as well as biology. My book can be especially useful in general science classes for beginning students. I also think that science journalists will find the book useful and that it will appeal to any readers who have an interest in learning more about science and are intrigued by the general topic of critical thinking or by some of the examples I discuss.